I love this idea. I did it. 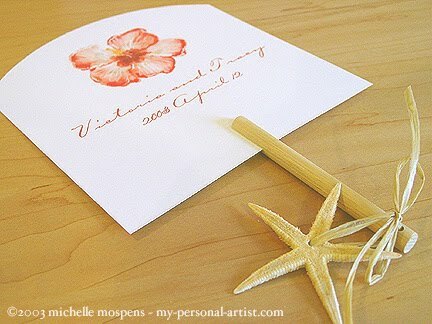 We bought a bushel of sea grass fans, tied a little ribbon to each one, and handed them out to our guests as they arrived at our ceremony. It is hot in the Caribbean, after all. Your guests will appreciate any thoughtful notion you can offer to battle the tropical heat. These fans from My Personal Artist are super cool. A little DIY – but you can do it. Laura~What an amazing blog you have! I have many friends who are ABOUT to get enaged and have wanted to do a destination wedding. I am addicted to all the pictures and cute ideas on here, bravo!I am now following your blog! Come pop back over to my blog sometime and follow back if you would like. It is always wonderful to meet other bloggy friends! Juliana from A Blonde Walks Into A Blog!